Have you ever dreamed of becoming a world leader, a singer, an actor, a lawyer, or a businessman? Everyone needs dreams to give them hope and the drive to go for it. 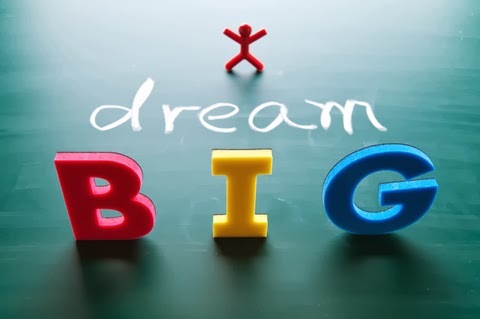 While being realistic and setting achievable goals might seem like the smart thing to do, we also need dreams to helps us aspire for higher goals and bigger possibilities. Every single thing accomplished by human beings was once someone’s dream. Dreaming is a wonderful outlet. Dreaming is pregnant with creativity and imagination which enables manifestation. It is a gateway to discovering your passion. But dreaming alone won’t make a dream a reality. Once you dream big, then it’s time to do big things. Were it not for the dreamers, we would not have all the wonderful things that our present civilization needs. The television, telephone, flying machine, the automobile etc, all of these and other innumerable inventions were at one time only a dream in the minds of someone whom the world called a visionary. Today, the world needs more daytime dreamers than ever before, dreamers who will do or die to achieve a dream and make it a reality. People who have the guts and persistence to go for their dreams and make things happen are like heroes to the rest of us. They are beacons of possibilities. What if we all went for our dreams like them? What would this world look like? Everyone would encourage each other and things would get done with unprecedented speed and creativity. Ideas tend to flow when people are open to them. If everyone was encouraged to dream and to create, many of today’s problems could be solved and inventions could soar to an all time high. What the world truly needs today is peace in all areas. The only wish of the world is to bring an end to war, violence and hatred. Every dreamer has this yearning to make a difference. But on the contrary, there is so much turmoil and unhappiness in the world today. What are our goals, dreams and ambitions, our hopes and fears? It is time to imagine a future dominated by love, peace and harmony, and therefore we need dreamers who will sit back and focus on changing the paradigm, dreamers who are willing not just to think out of the box, but to jump out of it and envision a higher expression of humanity. Every individual passionately believes in making it a better world for us and others. “I dream of a better world. A world in which we celebrate each other’s uniqueness. A world in which we co-operate and overcome the most severe challenges ever faced by our race. Martin Luther King Jr. was a dreamer who made his dreams into a reality. All it takes to dramatically improve our world today is a few committed people who really believe in their dreams and who’ll do whatever it takes to make those lofty dreams come true. We are moving into a turbulent phase in which there is a risk that events could overtake us. Now is the time to sit back and really look at what is going on with the world and ponder. Now is the time to focus with complete honesty and clarity on what your spirit and soul desire. Your thoughts create your reality and so once you control your thoughts, then you control your reality. “All men who have achieved great things have been great dreamers.”- Orison Swett Marden. Every measure of success we have ever known emanated from a dream. Sometimes the only obstacle between you and your goal is you. Every individual has greatness within ourselves and we shouldn’t be afraid to realize it. If you have a dream and believe in it, you will do anything to make it a reality. “The world needs dreamers and the world needs doers. But above all, the world needs dreamers who do.”-Sarah Ban Breathnach. We should take inspiration from these sayings which give us hope that the dreams we have do not end up in vain. To stop dreaming would be to stop living. We owe ourselves the opportunity to experiment with our dreams and we may even fail at times, but this also creates the opportunity to learn how to wildly succeed. Let’s dream big – our world needs dreamers.